on making a layered card. 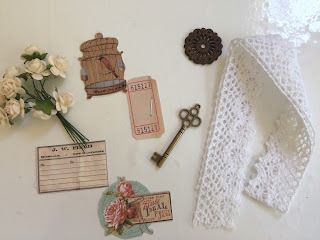 I love layering papers and embellishments an all projects. 1. Gather any stamps or images that you want to color. You can use paint, inks, sprays, colored pencils etc. I used a Creating in Faith stamp called "Eve". "Tales of You and Me" Paintable Paper by Prima. 2. Choose some papers from a paper pad. To make it easier for you, use one that is neutral. Free from too many colors. for you to add the same color as your images. The paper I used is "Vintage Emporium" by Prima. 4. Add some color to some of the papers that you added gesso to. This is optional. But I wanted to add a little color. My own color to the paper. 5. Get out some embellishments that you think will match. You may not use all of them. and the Lace is from the ARTc "Victorian" Pack. 6. Now just add your elements.